the pink clutch ...: Happy Father's Day!!! If I was magical I would have twinkled my nose and Lawyer would have woken up this morning as Bobby Flay. But ... sadly for him ... notsomuch!!! Since this was not possible we gave him the gift of sleep (til 10:30 am), pancakes (which he made) and the gift of chosing his day. He has chosen to lounge in his boxers, watch TV, play on the computer and just hang!!! So ... hang we will do!!! Happy Father's Day to all our daddies. They work so hard ... and deserve more than one day to be celebrated!!! Pancakes sound like a great way to start the day! 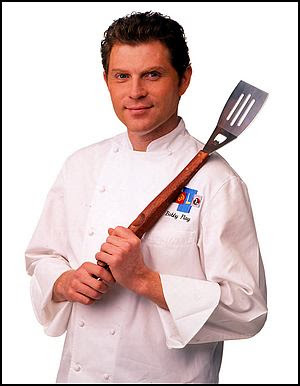 I have a serious crush on Bobby Flay! Ahhh, soo cute! Sounds like a great Father's Day! I just love Bobby Flay!